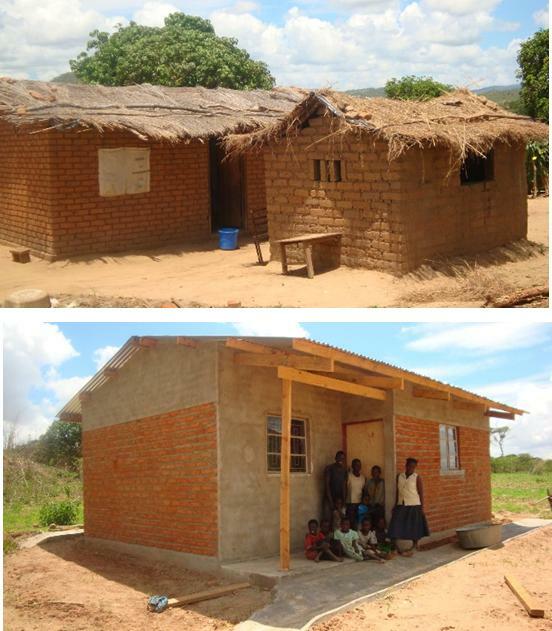 In 2010, a church in Argyll collected some £1,200 and donated it, through the Raven Trust, to help with the housing of orphan headed households in the Ekwendeni area of Malawi. John delivered this donation to Esther Lupafya when he was in Ekwendeni in the summer. We have just had an email from Esther reporting on what has been achieved with this money – a family of orphans now have a decent, weatherproof and secure house to live in. Esther was able to buy 40 sheets of corrugated iron (28 sheets of which were used on the house and the other will be used on another house), cement, window frames and doors. The top picture shows where the orphans had been living and the bottom picture shows them posing proudly in front of they new accommodation.